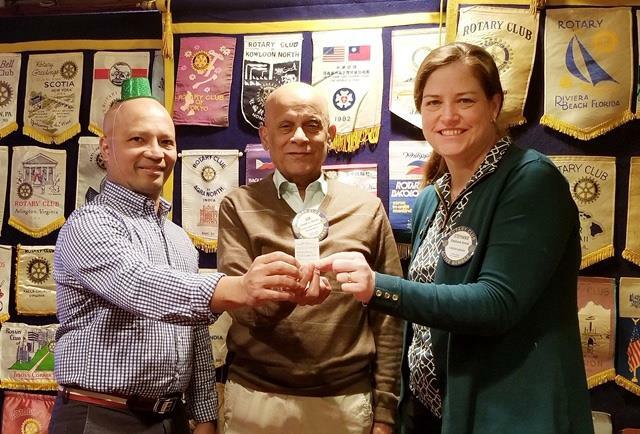 Congratulations to club member Joe Akkara, winner of the Rotary Club of Falls Church VA Cancun raffle drawing last night 😎 ⛵🌞 🏊‍♀️ 🇲🇽 🍹 🌞 ! He is pictured at center holding the winning ticket with Club President-Nominee Rene Calandria (left) & President Stephanie Arnold (right). Club member Patrick Sisk won 2nd prize -- a $100 Visa gift card. 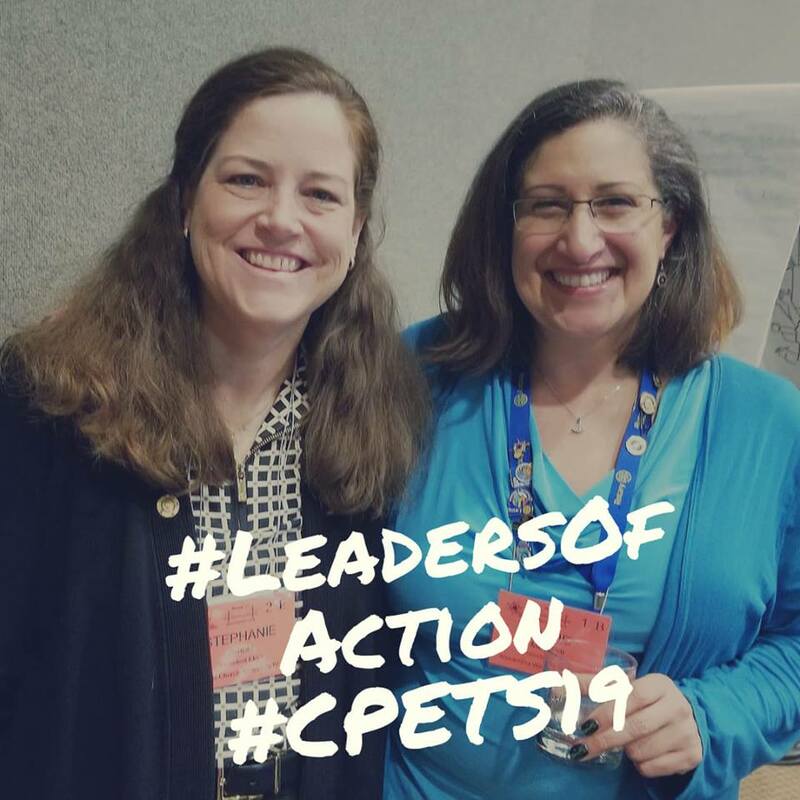 on a break from the #MegaMembershipSeminar at the 2019 Chesapeake Presidents Elect Training Seminar (#CPETS19) in Chantilly, VA. Publicity and PR; and PP and AG Elect Erica Brouillette, there for AGE training and to staff the District 7610 Peace Committee exhibit table. Join our club for our HOLIDAY PARTY on Thursday, December 20! 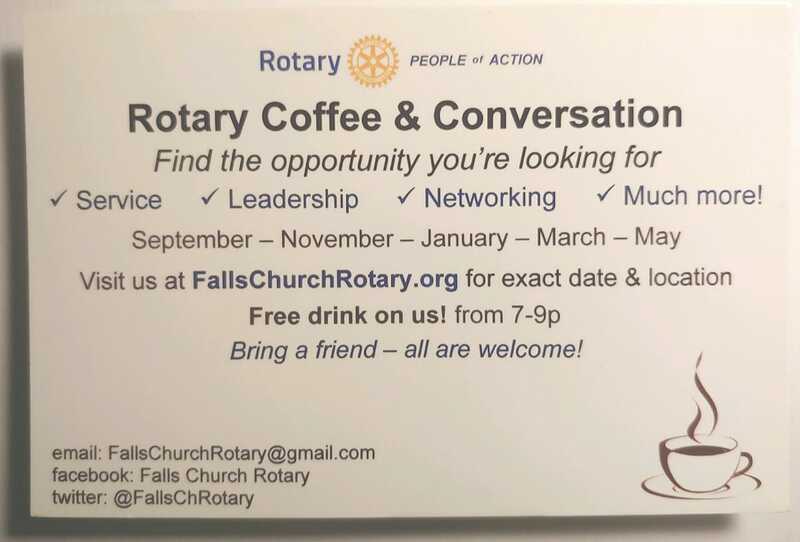 We’d especially like to see some of you who haven’t attended a meeting recently. We miss you! 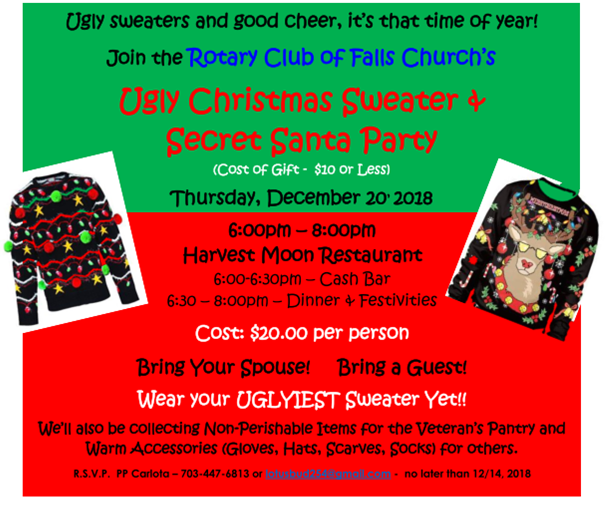 Wear your ugliest holiday sweater, bring a gift valued at no more than $10 to exchange and donations of non-perishable food items and cold-weather gear (including hats, scarves, gloves and socks) for the Veterans Pantry and other local charities. Please RSVP to PP Carlota at lotusbud254@gmail.com by Friday, Dec. 14. We’re expecting some special guests! It will be a fun evening! Raffle: Win a 6-Night Stay in Cancun! Rotary Club of Falls Church VA is hosting a fundraiser Raffle! Tickets are just $20 & only 300 will sold ... pretty great odds, right?! Drawing held March 7, 2019 at our club's early St. Patrick's Day dinner. Need not be present to win! Purchase your winning tickets from any FC Club member, via cash or check payable to Falls Church Rotary Club. Send us an email to fallschurchrotary@gmail.com to reserve yours -- and we can make arrangement to get your payment. $100 American Express gift card. All welcome -- fellow Rotarians from other area clubs too! 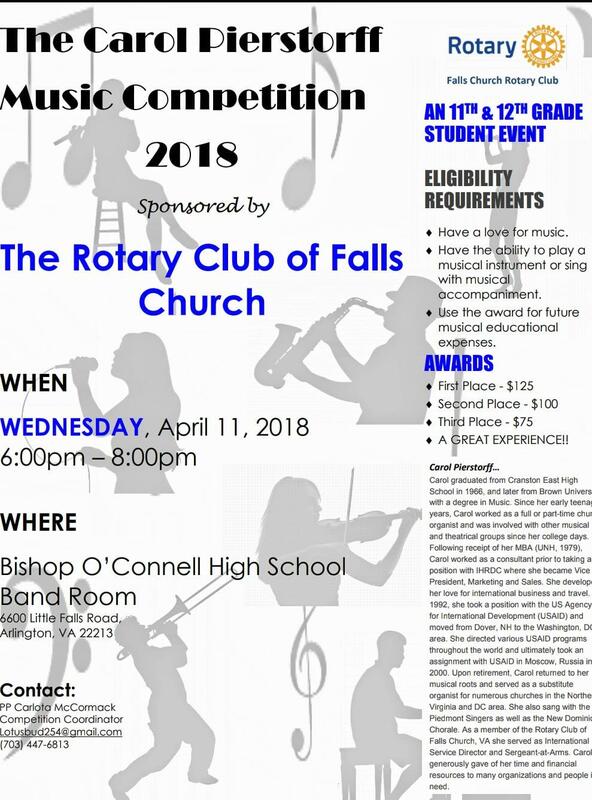 Click here to view the event at club facebook page >> For questions or more info, email fallschurchrotary@gmail.com. I hope everyone had a great Labor Day weekend! I look forward to seeing everyone at our club meeting tomorrow at Harvest Moon at 6:30pm. We will have a club assembly to discuss our initial plans for the year in the different avenues of service, fundraising, membership, etc. We’ll keep this a fairly informal discussion over dinner, and look forward to everyone’s input. It’s hard to believe – especially with this heat wave we’re having – that summer is pretty much over now that it’s September. 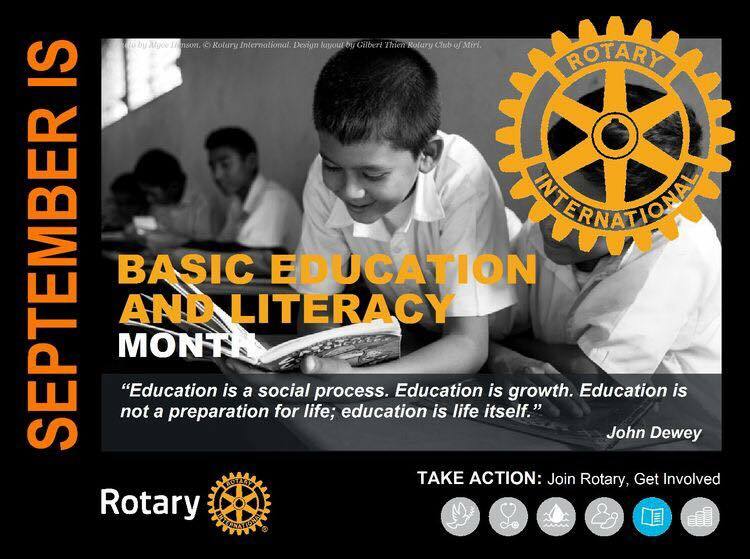 Did you know that September is Basic Education and Literacy Month on the Rotary calendar? Club Honors for Rotary Year 17/18! 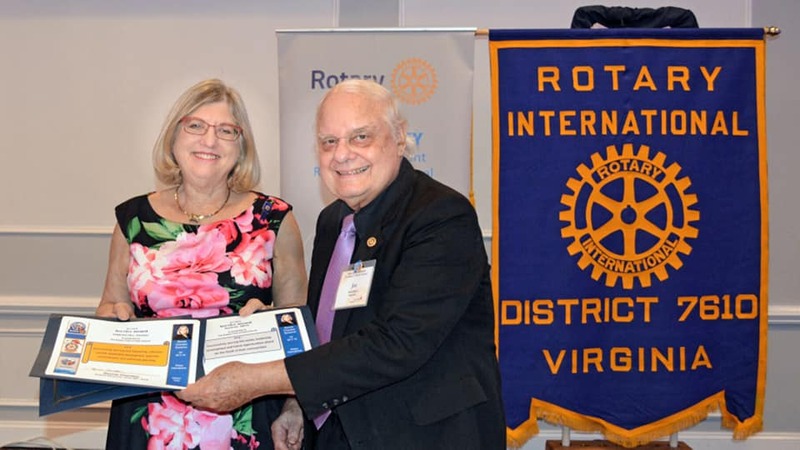 Club Past President and current Secretary Joe Scheibeler represented our Rotary Club of Falls Church VA at the Rotary District 7610 Banquet on Saturday, June 30. We are honored and proud to once again receive a Club Excellence Award and to be named "Best Small Club of the Year" under the leadership of Club President Erica Brouillette and District Governor Ronnie Chantker. We also received: Silver Award for New Generations; and Bronze Awards for Club Service, Community Service, and Public Image. We are in good company with all the other clubs being recognized for making the world a better place! 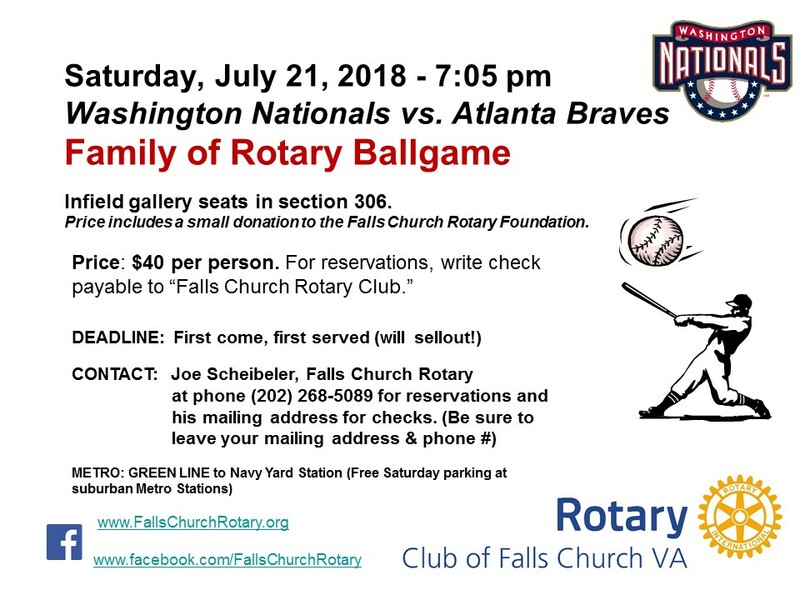 Join us for the annual "Family of Rotary" Nats game -- Sat., July 21! Email Falls Church Rotary Past President Joe Scheibeler for tickets at $40 pp -- selling fast! -- at joseph.scheibeler@usps.gov. A portion of ticket price benefits our Rotary Club of Falls Church VA community service projects. Everyone welcome -- don't need to be a #Rotarian to enjoy the game and fellowship! Join us for a Dinner Meeting! PP Carlota McCormack, Competition Coordinator. If you can attend, please rsvp to fallschurchrotary@gmail.com, so we can plan for refreshments! Walk for Peace & Peace Expo: Join us on Saturday, March 24! Did you know there are many ways to promote peace? Come and learn how you can promote peace and connect with organizations promoting peace in the community at our family-friendly community event! GET INSPIRED! Our dynamic and knowledgeable speakers will get you thinking about how you can promote peace at our family-friendly community event. WALK FOR PEACE! Get outside and walk with your community members along a scenic 2.2 mile route (stroller- and wheelchair-accessible). REGISTER! $20 Early Bird Rate Before March 1 (25 after). To register at our eventbrite site, click here. SPONSOR! Event Sponsorships & Exhibit Tables Available! Email Club President Erica Brouillette for details (flyer coming soon). Email: fallschurchrotary@gmail.com. NETWORK AT THE PEACE EXPO! Connect directly with community organizations and agencies promoting peace through their work as we showcase the good that they do. Email us if you are interested to exhibit at the event, including Rotary clubs with humanitarian projects (local or global). 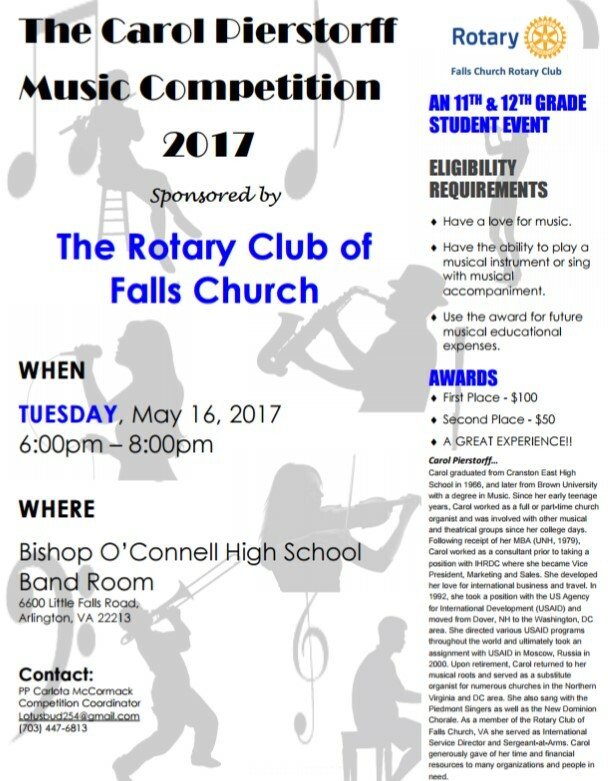 Event proceeds benefit the Rotary Club’s community service projects, including student academic contests and scholarships. For questions, email Club President Erica at fallschurchrotary@gmail.com. 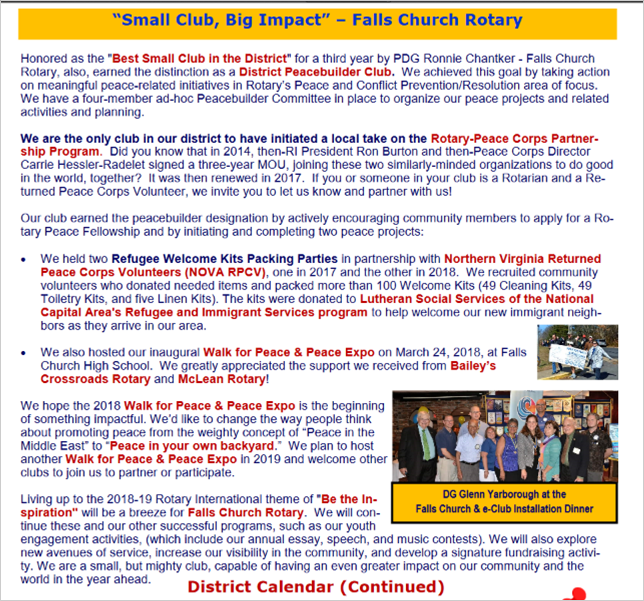 ** Visit and "Like" our club on facebook (you don't have to be a facebook user to view our content): Visit Falls Church Rotary on facebook. We have a new meeting policy and schedule. 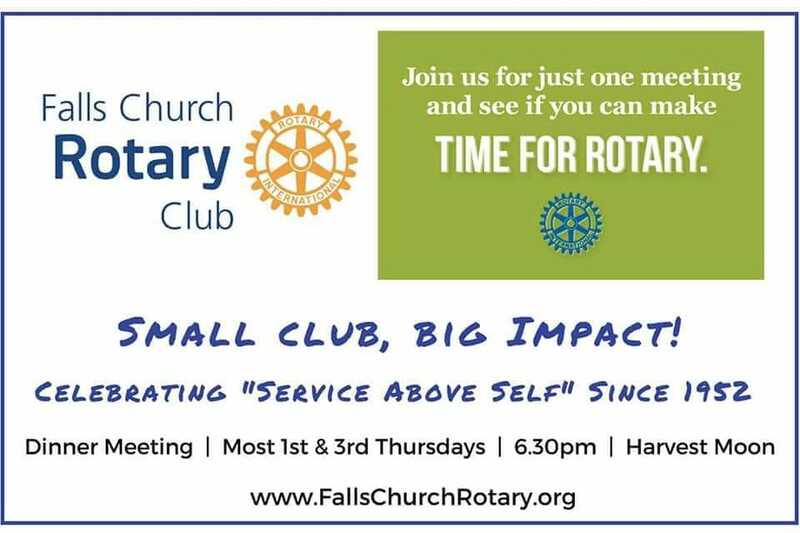 Our club now meets on the 1st and 3rd Thursdays for a dinner meeting at Harvest Moon, with events (or no meeting) on other Thursdays of the month. The current schedule is below. 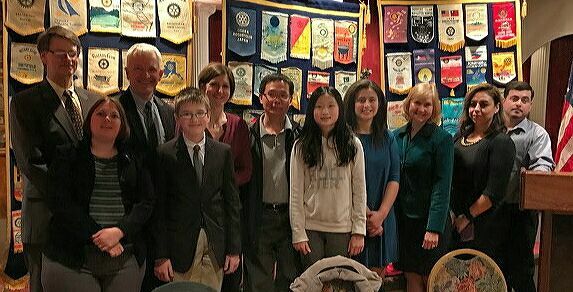 If you have questions or would like to present a program at a future club meeting, email us at fallschurchrotary@gmail.com Attn: Pres. Erica Brouillette. Falls Church Rotary meets for a dinner meeting generally on the 1st and 3rd Thursdays each month. Jan. 18 = District Gov. Ronnie Chantker’s visit. Our club meets on the 1st and 3rd Thursdays for a dinner meeting at Harvest Moon, with events (or no meeting) on other Thursdays of the month. The current schedule is below. If you have questions or would like to present a program at a future club meeting, email us at fallschurchrotary@gmail.com Attn: Pres. Erica Brouillette. Congratulations to the winners in our club's 2017 "Four Way Test" Middle School Essay Contest! Pictured here at our April 6 dinner meeting with their families and Club Pres. Erica Brouillette (far left). Well done, students! 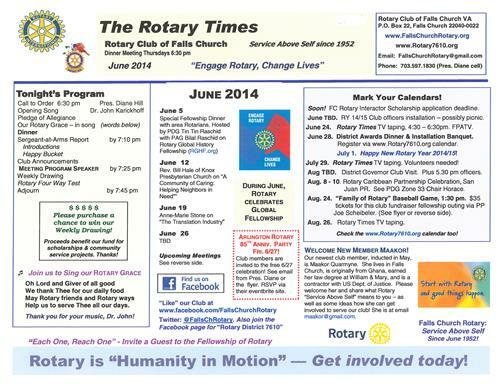 Click here to download a pdf of our Falls Church Rotary Club Bulletin for June 2014! Click here to view photos from our June 5th Rotary Fellowship Dinner -- thanks to everyone who attended for a great evening of Rotary fellowship and FUN! Falls Church Rotarians volunteered on Saturday, May 30, 2014 at the Stop Hunger Now packaging event, hosted by fellow Rotary Clubs: Annandale (lead), Bailey's Crossroads, and Burke. 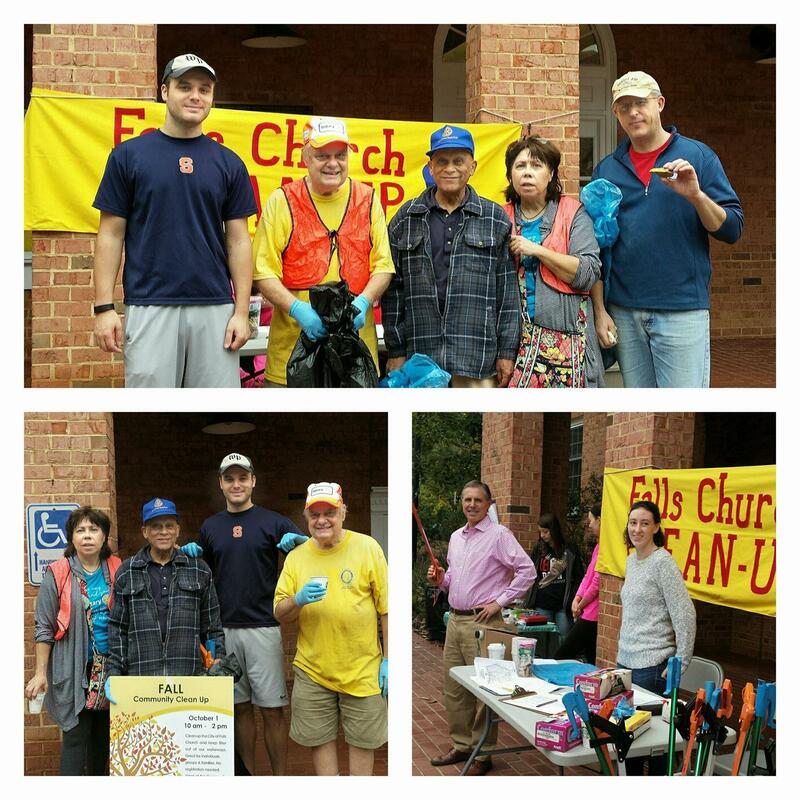 The event was held at the Annandale United Methodist Church on Columbia Pike. Scores of volunteers -- young and old -- from various community groups participated to package thousands of meals to be shipped overseas to feed hungry people. 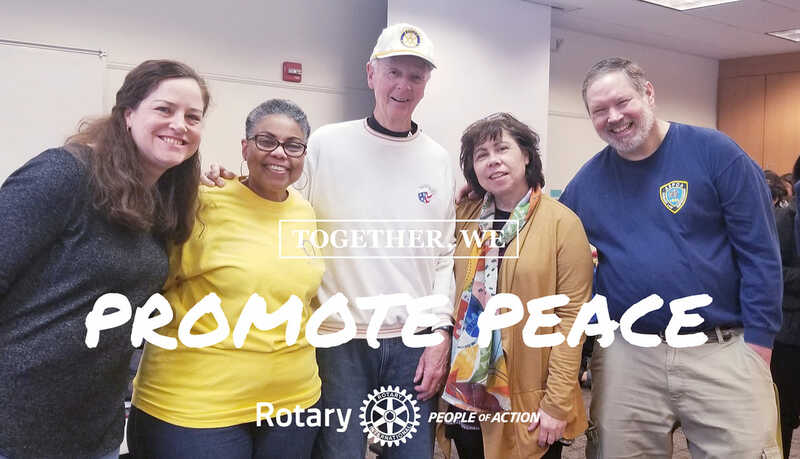 Club members participating included: President Diane Hill, New Generations Chair Erica Brouillette and fiance Kevin, and new Rotarian Maakor Quarmyne. Stop Hunger Now is an international hunger relief agency that has been fulfilling its commitment to end hunger for more than 15 years. Since 1998, the organization has coordinated the distribution of food and other lifesaving aid to children and families in countries all over the world. Stop Hunger Now created its meal packaging program, in 2005. The program perfected the assembly process that combines rice, soy, dehydrated vegetables and a flavoring mix including 21 essential vitamins and minerals into small meal packets. Each meal costs only 29 cents. The food stores easily, has a shelf-life of two years and transports quickly. Stop Hunger Now works with international partners that ship and distribute the meals in-country. The packaging operation is mobile enough to go wherever volunteers are located, and can be adapted to accommodate as few as 25 and as many as 500 volunteers at a time. 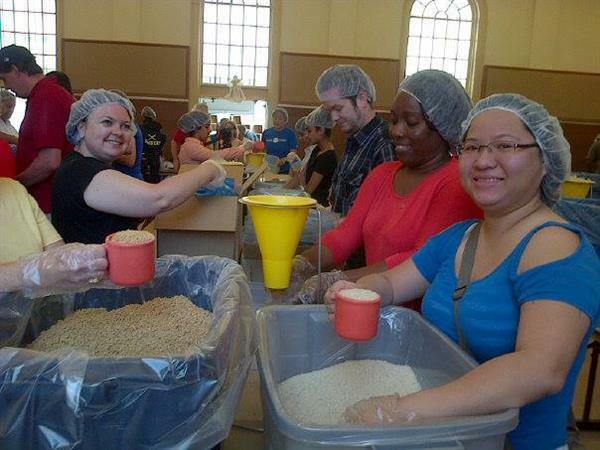 One SHN packaging event can result in the packaging of more than 1,000,000 meals. 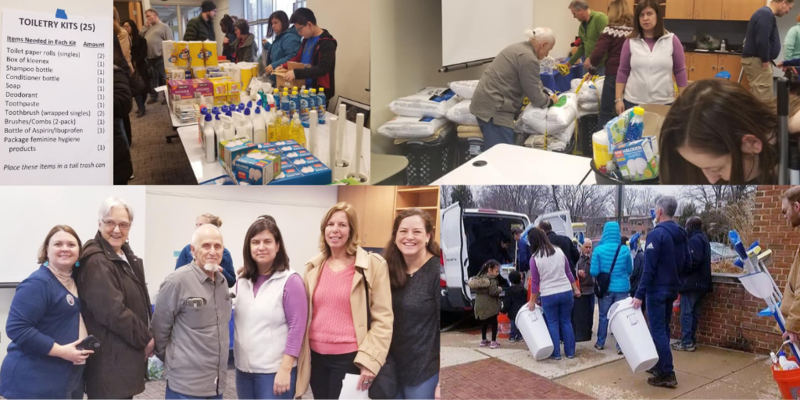 The use of volunteers for product packaging has resulted in an extremely cost-effective operation while, at the same time, increasing awareness of global hunger and food insecurity issues across the world. Stop Hunger Now provides over 70% of its meals to support transformational development programs such as school feeding programs, vocational training programs, early childhood development programs, orphanages, and medical clinics. Working with these programs helps enhance lives by giving beneficiaries the opportunity to break the cycle of poverty through education, skills development, and health care while also receiving much needed nutrition. Stop Hunger Now’s goal is to allocate 80% of its meals to transformational development programs by 2015. Rotary at Falls Church Memorial Day Parade! "Why Rotary?" Watch this video!